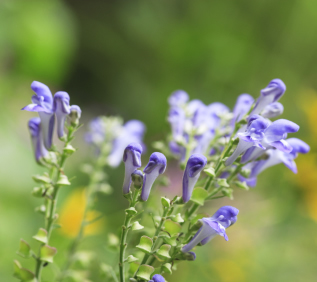 Preparation Methods & Dosage :Skullcap is most often taken as a tea or tincture, but is also found in capsule form. 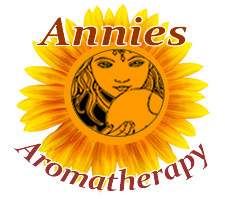 Tinctures made from the fresh herb are the optimal choice. Teas should be drunk hot. 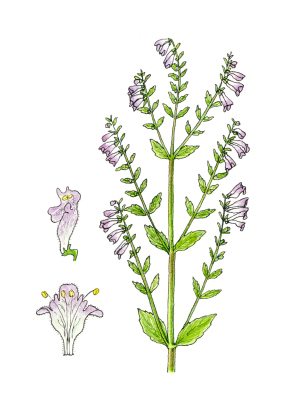 The root of a related species, Baikal skullcap(S.baicalensis) is used in traditional Chinese medicine to relieve colds, fever, high blood pressure and insomnia among other problems. Skullcap Side Effects: Avoid if pregnant. Safe in normal amounts, overdose can cause confusion and giddiness, possible seizures. Select a high-quality, reputable product with an assurance that it contains only Scutellaria. In the past, real skullcap was adulterated with Teucrium canadense, or pink skullcap. Flowers:Blue, varying to whitish; several or many, 1 in. long, growing in axils of upper leaves or in 1 - sided spike-like racemes. Calyx 2-lipped, the upper lip with a helmet-like protuberance; corolla 2-lipped; the lower, 3-lobed lip spreading; the middle lobe larger than the side ones. Stamens, 4, in pairs, under the upper lip; upper pair the shorter; 1 pistil, the style unequally cleft in two. Stem:Square, smooth, leafy, branched, 8 in. to 2 ft. high. Leaves:Opposite, oblong to lance-shaped, thin, toothed, on slender pedicles, 1 to 3 in. long, growing gradually smaller toward top of stem. Distribution:Uneven throughout United States and the British Possessions. By the helmet-like appendage on the upper lip of the calyx, which to the imaginative mind of Linnaeus suggested Scutellum (a little dish), which children delight to spring open for a view of the four tiny seeds attached at the base when in fruit, one knows this to be a member of the skullcap tribe, a widely scattered genus of blue and violet two-lipped flowers. The herb's first use as a cure and preventative of canine rabies has been disproved, but the common name mad-dog weed has persisted.